Whether you’re designing new buildings, or conserving and restoring old ones, architects like you can be counted on for exact results. That’s why your architect insurance needs to be tailored specifically to your unique needs. 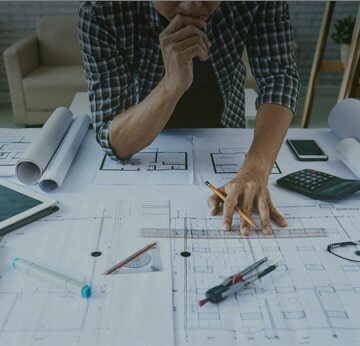 Engineers, builders, and clients rely upon you to provide the most safe and durable designs, and your general liability insurance helps protect your investment in your business. Whether you’re meeting with clients on site, or presenting them with designs in your office, you’ll be covered with the protection you need, at a cost you can afford. We know that coverage for professionals like you needs to be comprehensive, affordable, and straightforward. We even offer tailored plans to pay the way you need to — even monthly. Convenient, cost-effective architect insurance provides the protection and confidence you need to show your colleagues and clients. At Next Insurance, we make getting a quote and buying your insurance so simple you can even do it online, 24/7 at your convenience. Learn what architect insurance costs, and what is covered, instantly, and 100% online. Why Do I Need Architect Insurance? As an architect. everything you do must be precise. Like choosing the right insurance, so you get the coverage you need, and don’t pay for what you don’t need. Policies like general liability architect insurance give you protection so you can devote your attention to your work. You can even access your certificate of insurance online anytime, any place, from any device. Our insurance policy enables you to focus on growing your business, instead of worrying about what could happen. At Next Insurance, we keep your insurance costs low, by offering you the tailored coverage you need. Why Is Next Insurance Right for My Architect Business? You need your architect insurance policy to work for you. Our policies are simple, and you can access them online, 24/7. They’re easy to understand, so you’ll always know what’s covered. We also give you a tailored solution for your general liability insurance. You don’t have to be concerned about paying for all sorts of things in a “one size fits all” kind of policy. All you have to do is tell us about your business, and we’ll make an insurance policy that gives you the coverage you want. You also need architect insurance that’s affordable. We give you options on how to pay – whether monthly or annually is good for you and your business. Buy your architect insurance online, 24/7. It's so simple, most of our customers buy their policies on their cell phones. Answer a few questions, get your quote, and get coverage in under 10 minutes. "Great price fast coverage. I'd recommend them. fast and fair." "Great company, very reasonable rates." "This was easy!! Site is simple to navigate, sign-up and payments were a breeze, too!"